Not real sure where this belongs as it involves a hybrid arch top design that some would call a flat top. So I'm throwing it in here. I'm looking at an electric acoustic design that uses "flat" top and back arched to a minimum 15' radius (something I've done a lot before) but utilizing a tailpiece and high (3/4" - 1") moveable bridge, like an arch top guitar. A neck pickup will be attached to the neck block, which extends beyond the fretboard so the pickup won't be on a vibrating surface. The top would have F holes and braced with an X brace, more similar to arch tops than flat. No scalloping. The question is thicknesses. Most flat tops I've seen with tailpieces are built with rather thin tops, similar to other flat tops with a maximum of ~3mm. Most arch tops (carved) have much thicker tops with 5-6mm or so in the center and graduating down to roughly 1/2 of that. I'm aware that there is a lot of variation. My experience has been that flat tops have longer sustain but arch tops (which can have good sustain) have more punch (overhead) when pushed in an acoustic setting. So given the concept instrument outlined above, does it make sense that a thicker top (maybe ~4.5mm) would provide a more "arch top" sound ? I'm thinking unamplified. The amplified sound doesn't really come into play in my thinking except as it is influenced by the acoustic qualities of the box. At this point I'm not concerned with great tone quality from the box, just the sustain/punch question. Any ideas on the subject would be appreciated as thinking in my own little box is pretty limiting. Has anyone tried this ? The basic considerations are getting enough string pressure on the saddle to insure good contact while avoiding over stressing the top. Normal flat tops get the string pressure by tying the strings to the bridge behind the saddle, which produces a torque on the bridge, tension on the top behind the bridge, and compression along the top in front. Bracing is used to stiffen things up without adding too much weight. 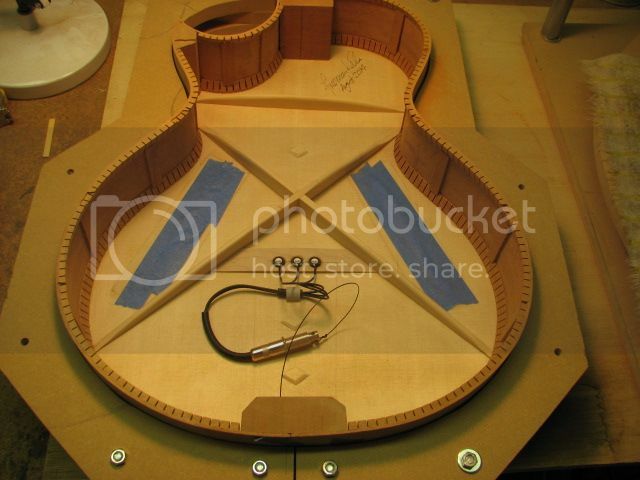 Archtops use a tailpiece to take up the tension load of the string, and make the bridge and top arch tall enough to give the requisite break angle over the bridge. This produces a down bearing force on the top, which is mostly taken up by the arch height and thickness, with some help from bracing. Lots of people have made flat tops with tailpieces, and the issue is always one of getting sufficient down bearing on the strings. If you make the bridge tall enough to get, say, six degrees of break over the bridge top, the down load is about 10% of the total string tension; maybe 20#. A thin flat top will need a lot of bracing to avoid collapsing under that sort of load, and six degrees of break is really minimal. Historically the violin and viol families developed from the early guitar, and you could read the evidence as suggesting that the best solution they could find using wood for that down bearing problem was the arched top. The gamba family is actually quite close to being bowed guitar: six strings tuned in fourths and a third, frets, and a flat back. The lack of widespread acceptance of flat top guitars with tailpieces is evidence that the idea is not ready for prime time. Taking the tension off the top doesn't make up for the added down bearing. BTW, I have made arch top Classical guitars with tops at 3mm thick over all, and they work fine structurally and acoustically. 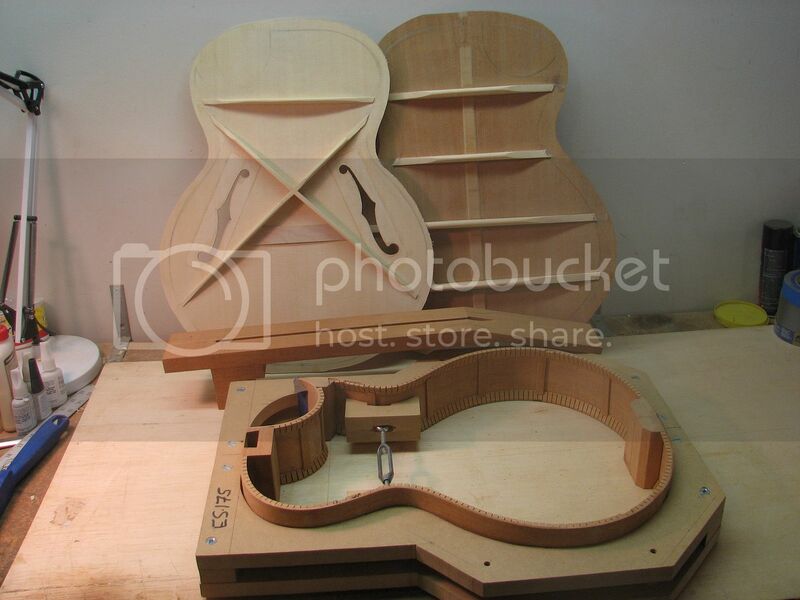 Instruments using a carved arched back with a flat top and a tie bridge actually make a lot of sense. Buscarino has been pretty successful with his 'Cabaret' model, and Gibson used that scheme on one of their models in production. I believe a carved arched back of, say, walnut, could emulate a flat rosewood back acoustically in the low range, and might work better in the high range as well. This seems to me to be another example of Pye's maxim that: "When the need is old the old ways are probably the best (unless a new technique has bee introduced), since it is unlikely that all of the designers of the past thirty or forty generations will have been fools". Hi Alan, thanks for the thoughts. I know Guild made pressed arch back guitars, may still for all I know. 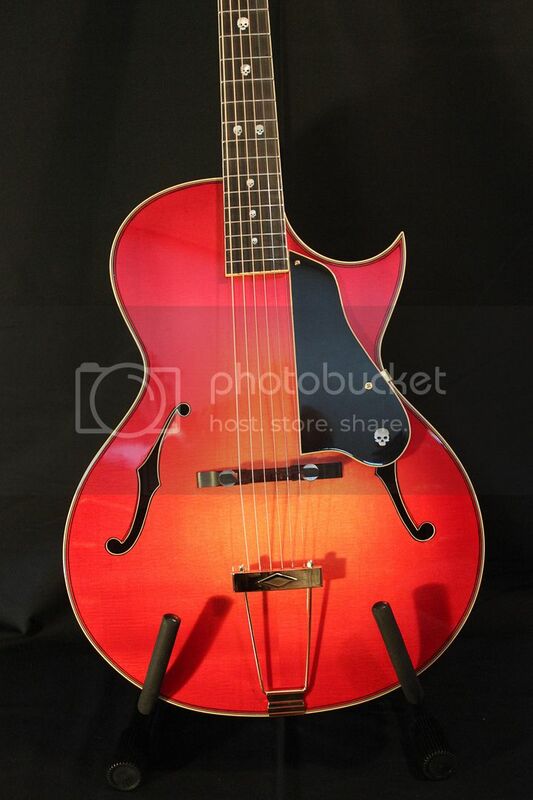 I've also seen and played an archtop classical made by Herb Taylor (Colorado) which was nice. I don't know his dimensions though. I've heard of pressed top arch tops, but I don't know of any that weren't plywood. I've built carved arch tops with flat backs and I've played an early Gibson arch top with attached pin bridge and oval (round ?) sound hole that was amazing for it's light weight and loud sound for such a small body. I don't remember if the back was flat or carved, but I'm thinking carved birch. That design was pretty unique with the top being mostly flat with steep arching near the sides. As far as historical precedent goes, the flat top/tailpiece guitars I've seen have all been very inexpensive instruments. The emphasis on cheap being the most notable thing about them. Sagging soundboards being a commonality. The Belluci classicals being an exception. The flat tops I've seen did not have any noticeable string break over the saddle. It's easy to see why cheapness alone is not in demand by serious musicians. But I wouldn't consider this a flat top. The arch I'm considering allows for some strength via the arch, and would require a higher movable bridge. Over a 21 inch length, the rise on the top is about 5/16", which may not be enough. I may be answering my own question though, as a 4.5mm thick spruce top isn't going to bend that much lengthwise anyway without heating and all sorts of ensuing difficulties. The guitars I've built with this arch before had tops below 3mm, which arched nicely, so If I do this it will have to be with that thickness. So I guess ifs don't really matter. Thanks very much for the comments, sometimes it just takes input from someone else to get the brain muscles working. I'll be doing some weight experiments to see how things move. I finished this one a few months ago - all mahogany, ladder braced. I was trying to channel the 30s Stellas and Regals, thus the MoTS fretboard. The top is around 2.3mm thick and was radiused just by shaping the bracing by eye - my guess is it's around a 10 ft radius. The bridge is 12 mm high. There is a fairly beefy brace (around 12 mm tall) directly under the bridge location which aims to stop the top collapsing. It's short scale (24.5 inches) and fairly small bodied (12.5 inches lower bout) and strung with medium strings, so the overall tension is noticeably lighter than a dreadnaught. It's very light and responsive, with lots of volume and plenty of sustain (a nice surprise as I had no idea how it would turn out!). So far there is no sign of the top sinking even slightly, though who knows how it will fare years down the line. In terms of sound, it's very much a flat top rather than an arch top sound, which is what I'd hoped for. I'd guess that a thicker top would cut down on the sustain, if that's your aim. My reading suggested that it would be OK to trade off top thickness against bracing height, so that's what I did. All I can say is that it's working so far. Good do see somebody has made it work. A lot has to do with how much arch you build in, and how it's shaped. Sometimes it's hard to describe that clearly. 'Flat top' Neapolitan mandolins and the old 'Chitarra Battante' used a cranked top, which was scribed inside and bent down just behind the bridge by enough to get the needed break angle. There would be a hefty brace at the break. I built a ladder braced copy of a Preston 'English guittar' (a cittern of sorts) several years ago that used ladder bracnig and a high overall arch (maybe 6' radius?) that has held up reasonably well with ten metal strings. Recently a student of mine restored an original English guittar by Preston of London, ca 1780, with a similar arch and tall bridge, but using X bracing. The top had the usual splits on the edges of the fingerboard, and the neck had shifted forward a bit, but there was no sign of the arch collapsing. Structurally and sonically it's a much more successful instrument than the one I made, judging from a direct comparison. There are some pictures of similar instruments in a GAL issue about a year back, and I could dig out some pics as well. Calculating my archdukes it somewhere between a 6' and 8' radius, rather more than I'd guessed. Am I right that floating bridge instruments experience less "folding up" stress because the tailpiece directs the string tension in line with the neck and sides, rather than via a fixed bridge which wants to rotate into the soundhole? Nice work Chris, I wouldn't have picked up on the MoTS fretboard if you hadn't mentioned it. A quick question if you don't mind... Did you extend the arch in both directions (like a section of a sphere) or just side to side (like a Prairie State/Larson) ? It sounds like your arch is a bit more than mine (which I thought extreme). 2.3mm is as thin as i've ever gone with a top, but I've seen lots of thin tops and made my fair share of them. I've never done an arch that was just side to side, maybe after 44 years it's time to try one. And for what it is worth I had to put a small wedge under the fretboard to get the right neck geometry. The guitar does have a couple of quirks that suits the owner. I would characterize the sound as "arch toppy" - quick attack and decay, more fundamental that complex. Freeman, that looks cool! With the 16' radius, do the ribs look super thick at the waist (and cutaway) compared to the lower bout? Thanks Freeman, That's pretty much exactly what I was contemplating, right down to the size of the arch. The only difference I can see is my thought of using a thicker top. If it does sound more like an arch top, then that doesn't seem to be necessary, which is good given the difficulty. I've often wondered if the use of F holes is more important in forming that sound. It does change the shape of the main vibrating mass quite a bit compared to a round or oval hole design. Bryan Bear wrote: Freeman, that looks cool! With the 16' radius, do the ribs look super thick at the waist (and cutaway) compared to the lower bout? Chuck Morrison wrote: I've often wondered if the use of F holes is more important in forming that sound. It does change the shape of the main vibrating mass quite a bit compared to a round or oval hole design. I've always felt that some of the sound of an archtop comes from the use of a floating bridge and tailpiece. That completely changes the way the top vibrates - you have that direct perpendicular component and almost no rocking. The only anecdotal evidence is a brief discussion with Todd Cambio who builds 1930's style ladder braced guitars with both pinned bridges and tailpieces. I asked him what he thought the difference was and he said it was subtle but the pinned bridges seemed to have more overtones, were "complexer" sounding while the tailpiece instruments seemed to have more of the fundamental frequency. I think Roger Siminoff discusses this in his book on voicing tops but its been a long time since I read it. My friend insisted that he did not want a pickup in this guitar but since I really had no idea of what it was going to sound like, at the last minute I hedged my bet and installed a sound board transducer before the back went on (I figured that if I waited to find out what it sounded like there was no way to change). Anyway, I put the jack inside with a piece of string to pull it thru the hole after the guitar was finished. I plugged it in a couple of times, actually sounded pretty good, but I doubt that my friend ever has. Chuck Morrison wrote: Nice work Chris, I wouldn't have picked up on the MoTS fretboard if you hadn't mentioned it. A quick question if you don't mind... Did you extend the arch in both directions (like a section of a sphere) or just side to side (like a Prairie State/Larson) ? It sounds like your arch is a bit more than mine (which I thought extreme). 2.3mm is as thin as i've ever gone with a top, but I've seen lots of thin tops and made my fair share of them. Gaudy but tasteful was my aim for the fingerboard! My design was pretty much made up as I went along. I've never built the same thing twice, so much of my building consists of standing and looking at where I'm at, then sucking air dubiously through my teeth. For the top, I knew I wanted a side to side arch to resist the downforce on the bridge. But I also wanted a reasonably flat upper bout to make attaching the fretboard easier. So what I did was to construct a primitive solera, taking a baseboard and attaching 6mm MDF at the upper bout and all around the edges. This gave me an arch height of 6 mm across the middle of the lower bout, so I shaped the brace under the bridge to that. The diagonal brace was shaped by taping sandpaper inside the lower bout, clamped down with a small block at the centre of the lower bout, and then sanding it to the shape the wood wanted to go. So, effectively, I have a 6mm dome on the lower bout, both side to side and front to back. The body was built up from the top (face down on my improvised solera), then sides, and finally back. The back was heavily arched both fore and aft and side to side. The hard part was keeping the sides vertical, as I was building freehand without a mould. Clamps/props/wedges etc kept them reasonably vertical as they were glued to the top, and then the bracing across the top held them in place while I glued the back on. I used HHG for the body glue up, so I could glue in sections and straighten up as I went. There are quite distinct irregularities, but I've hidden them as much as I could! And its owner, my best friend and singing partner, really loves the guitar, so I guess I did OK.
"I've always felt that some of the sound of an archtop comes from the use of a floating bridge and tailpiece. That completely changes the way the top vibrates - you have that direct perpendicular component and almost no rocking." You're right that there is no significant rocking force on the bridge of a tailpiece guitar from the twice-per-cycle tension change. However, that's not the major difference people think it is. On any guitar most of the actual sound production comes from the 'vertical' component of the transverse motion of the string: the string moves 'up and down' and pulls the top along with it. In terms of the actual force involved, the tension change signal has an amplitude averaging about 1/7 that of the transverse force. Even on a tie bridge this is not going to produce much motion, simply because we build tops to resist bridge torque. Finally, the rocking motion pulls the top up behind the bridge and pushes it down in front, so the sound output cancels out to a large extent. When I tried it driving a string 'vertically' with respect to the top plane on a tie bridge guitar produced about 20 dB less output than driving it 'horizontally': that's 1% of the actual sound power. In another experiment nearly doubling the string height off the top of a Classical guitar (from 11 to 18 mm) made no measurable change in the power output, but resulted in a bit larger proportion of the sound being in the second and fourth partials, because of rocking. IMO the main cause of the difference in sound between arch tops and flat tops is the sound hole. Simply going from 'F' holes to a round or oval sound hole on an arch top gets you much of the way toward a flat top sound. The carved arched back does something too, and much of the remainder has to do with the high impedance of the arched top, and the generally higher normal mode frequencies due to that arching and thickness of the plate. Alan, your last post pretty much summarized why I was looking at a thicker, highly arched, maybe I should say "flexed" top with F holes. I think it's enough to warrant and exploratory build, although maybe not as thick as I had originally considered, or maybe just that thick in the center. We'll see. Thanks everyone for the photos and comments. Freeman, that is a gorgeous guitar! Beautiful sunburst! What are the skull inlays made of? Just a followup to the discussion, which started out with me wondering about the sound for a highly arched (15' radius) "flat top" with F holes. I did build one and record it being played. I compared it to the arch top I'd built a few months before and as far as I can tell, the "hybrid" design sounds more like a flat top. I'm including videos of each for reference. Both 8 strings with split-Dorian (Em13) tuning. I don't have great hearing (was it worth playing in rock bands ? ), so I'm open to your perceptions. The arch top has phosphor bronze strings (ground flat), the hybrid has steel (electric) strings. The string gauges are the same. The intent was to put a pickup in the hybrid, which I haven't done yet. The instruments are the same shape and depth, other than the carved top/back having greater height, so there is more interior volume in the arch top. The F holes are the same size, shape and placement. The scale lengths are the same, 24.9". The bridge is a bit under 3/4" tall on the hybrid, about an inch on the arch top. Spruce top on the hybrid, is about 4mm thick in the center, tapering to 2.7.. or so at the tail and neck blocks. Similar for the yellow cedar arch top, but closer to 5mm + in the center and tapering is more around the sides and tail block. The hybrid is more flexible and moves more under the string pressure. The break angle is 11.5 degrees on the arch top and 7.5 degrees on the hybrid. Basic X brace on both tops. The arch top has carved maple back, the hybrid has a flexed Oregon Myrtle back with an X brace. The photo is a bit grainy from being reduced in size to upload. Yes, the hybrid sounds more like a flattop but you should probably have similar strings on both guitars to get a fair comparison. Agreed. 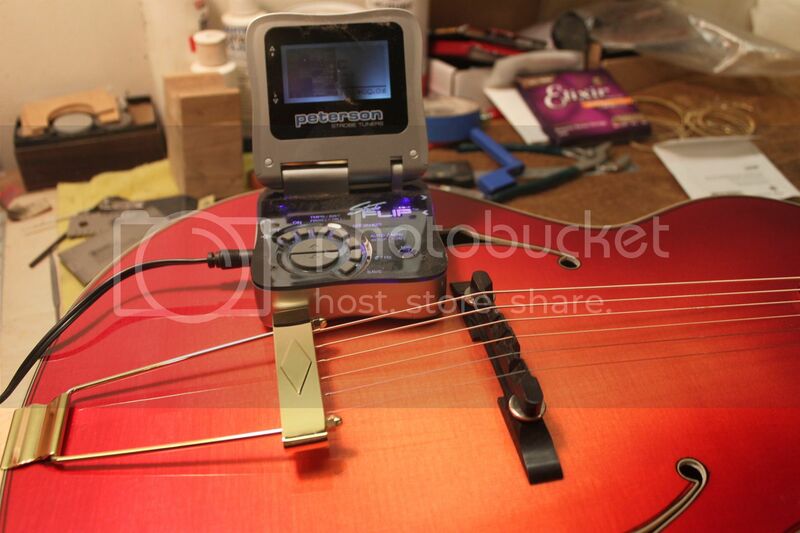 The electric strings were there because of my intent to add a pickup, which is still sitting in the shop. I was quite surprised how bright they sounded. Since phosphor bronze strings are pretty bright too, I didn't think it was an unfair comparison, but I agree it would be better with the same strings.